Today I’m going to cover the easy way to quit smoking. It actually requires almost no willpower. It is the way that I quit. I used electronic cigarettes or to be more exact a vaporizer. 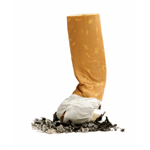 Can you think of an easier way to quit smoking cigarettes then switching to a healthy way to smoke? Everything you love about cigarettes is improved on by electronic cigarettes. I share what happened to me each step of the way below. I would have quit years ago if I would have known how easy it really is. What is it Like to Switch to E Cigarettes? Let’s think about all the things you love about cigarettes. If there is something I missed here tell me in the comments below. 3. You will be able to find an amazing flavor that you love no matter what it is. It is hard to simulate the taste of tobacco, but there are flavors that come darn close. After a short period of time almost everyone gladly tries different flavors. This is exactly what happened to me when I quit. I stopped using regular cigarettes half way through the day when I received my E Cigarette by mail. A few things surprised me when I first tried it. It was very easy to get it working. For some reason I was worried about accidentally putting the liquid in the wrong hole? As per whether I wanted a cigarette. I constantly found myself looking for one in my pants out of habit. I also kept having the thought go through my mind that I wanted to compare them, but thankfully I didn’t. I threw out all my cigarettes at the end of the day to keep myself from going back to them. The only desire I had for a regular cigarette felt more like the need to follow a habit then like a physical withdrawal. Every time I felt this need to follow the habit I went for the E Cigarette instead. After I threw out my regular cigarettes and this need went away. Special Note: Over 2 months and I’m still going strong. I’ll never go back. How Did I Feel at the End of the Day? I could walk up hills without losing my breath. I felt absolutely amazing to say the least! Every smoker has to try these!!! I did a TON of research before I made a decision. I ultimately decided to buy the Apollo Superior eGo Kit ( I Later Changed to another that I preferred ). I wanted the Halo Triton, but it wasn’t available at the time. I was surprised by the draw and just about everything. The E Juice I bought with it was good, but it felt a bit powdery? I really couldn’t say anything bad about the Apollo. I also tried an NJOY at the same time and while it was ok I didn’t continue with it mainly because of the price. They are very expensive in comparison to about $30 a month for the tank systems. I really wanted to get this to work, so I also purchased an Joye eGo-C battery with a iClear 16 Dual Coil Clearomizer. This setup was highly recommended to me by some people that I considered to be experts. As far as I have seen the Joye eGo-C is the most popular E-Cigarette / Vaporizer. It arrived a few days later and it was even more amazing! It allowed me to change the voltage from 3.2V to 4.8V. This was great because I could find the heat and vapor level that worked best for me. Kanger ProTank, but I replaced the clearomizer head with an EVO clearomizer head. The batteries last for years. The Clearomizer heads go bad every few months from what I have seen. You can buy a replacement head for about $3. Everyone likes different flavors. The following is just my opinion. I just picked the E Juice that received the best reviews on the sites. I was very satisfied with the Apollo Classic Tobacco, but after the first couple days I wanted to try some different ones. Like I said before it tasted like mocha / cotton candy? I didn’t think I’d like something like that, but I did in the beginning. Formula 51 1.8% Nicotine Tobacco : I didn’t like this as much actually because I thought it tasted too much like burnt tobacco. Alt Liquid RY4 : A little like the Apollo E Juice I received. I really like this juice even though it is cheap for some reason? Bunch of Halo E Juices : I have enjoyed Halo juices. The Tribeca is particularly good. Alien Visions E Juices : In my opinion, this is the best E Juice manufacturer period. Boba’s Bounty is hands down the best juice I have ever tried. Havana Gold is the second best. Blend 4 is also amazing. Many people rave about Gorilla Juice. I think it is ok, but it definitely tastes like bananas so if you’re into that give it a try. Vaperite E Juice: They have a bunch of top flight desert juices. They are high quality, but very intense. I particularly love their VR4. If you like butterscotch then give it a try. It is quite good. What I didn’t like: I’m not going to name names, but I was grossed out by a number of juices that taste like bubble gum. In my opinion if you hear something described as bubble gum stay away! Once you start getting into vaping it is very important that you use the right voltage if you have a variable voltage vaporizer. 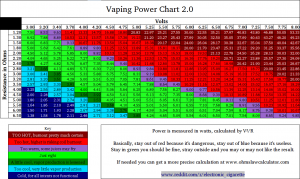 Here is a chart I use to find the right voltage. (Click it to enlarge). This normally confuses everyone in the beginning, but lets say you have a Kanger ProTank that has a resistance of 2.5 Ohms Ω. Look for your resistance on the chart and if it isn’t there pick the next lowest resistance. In this case pick 2.4 Ohms. Now follow the green colored part of the chart to find the recommended watts. Drift your finger up to the top and you’ll find the recommended volts which would be between 3.20 to 4.50 Volts. It is important to stay in that area unless you want to burn your E Juice or destroy the coil. A scientific study was done on the long term effects of inhaled nicotine. Here are the findings from a 2 year study. Both of the above are used in many food products. Because its low chronic oral toxicity, propylene glycol was classified by the U. S. Food and Drug Administration as “generally recognized as safe” (GRAS) for use as a direct food additive. Numerous animals were administered 50 to 700 times the amount of glycol the animals could absorb by breathing air saturated with the propylene glycol.This study failed to reveal any differences between the animals kept in glycolized air and those living in the ordinary room atmosphere. These flavors are usually the same flavoring used to flavor food and candies. So, that is a basic run down of what you may want to know about E Cigarettes / Vaporizers. This is without a doubt the easy way to quit smoking. If you have any other questions leave them below and I’ll do my best to help. I’ll gladly cover more about how the E Cigarettes work if anyone is interested. I could cover the difference between cartomizers and drip atomizers. I could go into ohms and volts and why that matters. I’m very happy to help in any way when you want to kick that habit. Really would like to quit, but it seems to be some what confusing on which kit to buy. Checking out eBay uk, I can’t find what you currently use. Can you recommend a complete kit to try this out with? I use the Apollo Superior eGo Kit. I have tried a ton of different vaporizers though and the only difference for the most part is the battery life. That is why I use the Vamo. It lasts for about a day. If you want a cheap solution to try, search for EGO-C Twist at fasttech.com. Fasttech is extremely cheap since there is no middle man. You can get an EGO Twist (variable voltage) unit for $12. You’ll need an atomizer as well to hold your juice. You can get an EVOD Atomizer for about $2 on fasttech. Juice wise I don’t know really because I dislike many that I tried. If I had to recommend something that most everyone likes, look at Alien Visions Blend 4 (Very Mild) or their Bobs Bounty (Very Complex). First off thanks for a great website … I came to it through your channel on YouTube (no surprise there really) and your Python 2.7 tutorials which I still go back to every now and again — they really helpde in my switch from embedded C development to Python scripting. I quit smoking years ago, the old fashioned “cold turkey” way, but my brother switched about 18 months ago to eCigs and seems intent to continue smoking them for the rest of his natural. This worried me (and his wife) a lot, so thanks for the reference to the medical studies above. Do you see the eCig as a step-stone to quitting all together? or as an end in itself for the moment? First I personally have read enough to make me believe that if you make your own e liquid you don’t have anything to worry about. Every chemical in my juice is FDA approved. It is just vegetable glycerin (Vegetable Oil), Nicotine and food flavorings. I’m an extremely nervous person. Years ago I started smoking and got hooked because it allowed me to think. I continued to smoke because I was told the only alternative was to go on pharmaceutical drugs for ADHD, or whatever the doctor thought I needed. When I figured out I could use e liquid instead I went that route. I have not had a single negative side effect. Some people get rashes because of propylene glycol, which I don’t think is dangerous (Its used in numerous things that millions of people ingest each day), but I wanted to make that point. I started at 26 mg/ml of nicotine and now I’m down to 16 mg/ml. It fixes my brain and keeps me off of weird pharmaceutical drugs so I’m happy about that. Since I wrote this I have learned a lot more about the topic. I just didn’t get into it because it didn’t seem like anyone was interested. I’ll gladly answer any other questions. I now use and probably will continue to use a Provari mini with a Russian 91% RBA for many years now. I also make 100% of my own liquid. This is my favorite e liquid recipe.